Fall is just around the corner! 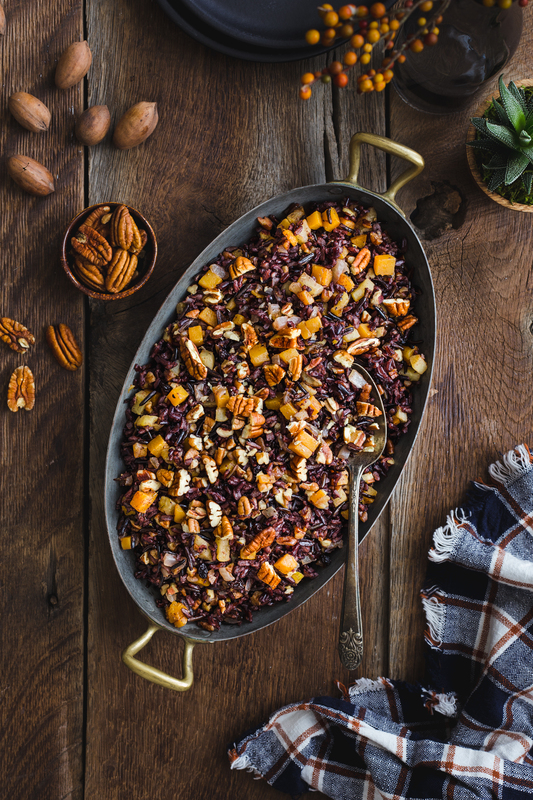 Pecan Wild Rice Pilaf is a great transition side dish from Summer to Fall and is made with a blend of wild and black rice seasoned with warm fall spices. 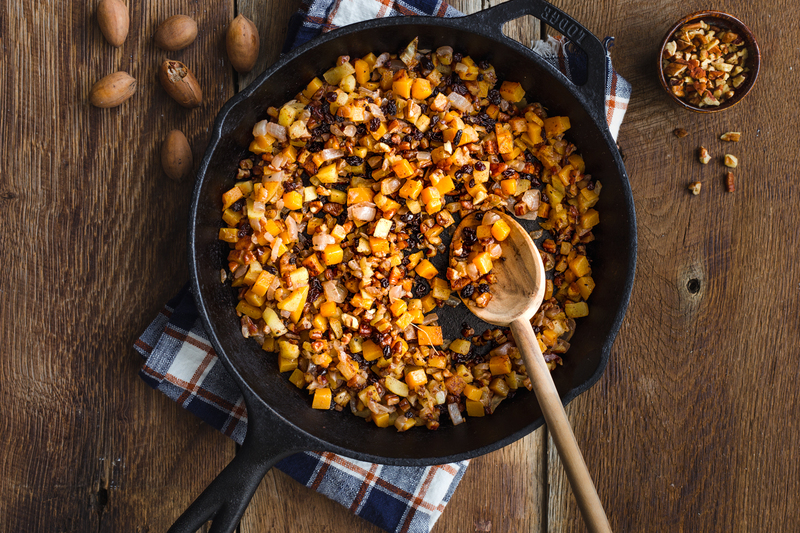 Caramelized butternut squash, apples, and buttery pecans add flavor, texture, and crunch. 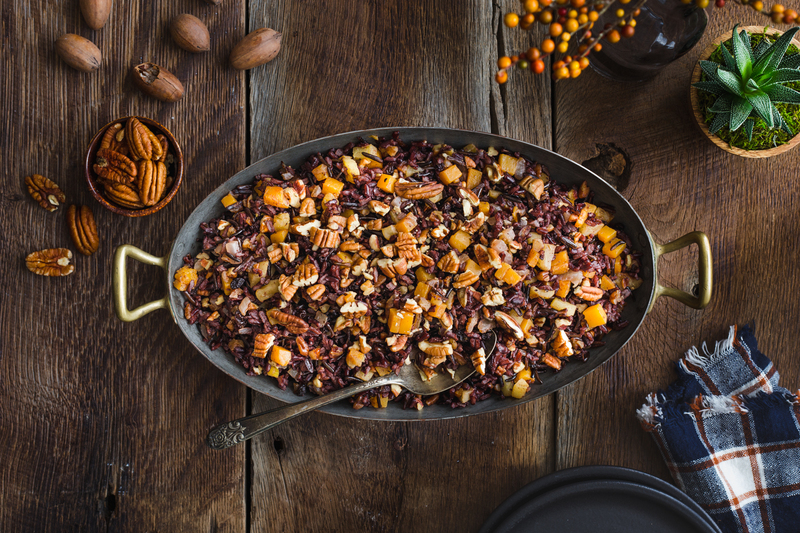 This post, Pecan Wild Rice Pilaf, is sponsored on behalf of the American Pecan Council. All opinions are, as always, my own. This is a chill in the air, friends, and I’m rejoicing! The last few weeks here in Ohio have had a decidedly Fall feel about them. I know once September hits it could possibly warm back up, but hanging out in the mid 60’s with a breeze has been down right glorious. I feel like always start my blog posts with a mini-weather report, but my mood is so dependent on what is going on outside my window. When it’s cool and crisp, I feel energized to move around and get stuff done. No longer bogged down by the heat and humidity my body and function like a well-oiled machine. As I’ve been sharing with you for the last 5 years (yes, 5) Fall is my all-time favorite season for pretty much any reason you can think of: colors, weather, clothes, food, holidays (bacon herb oven roast turkey, anyone?) – you name it. I bought my first butternut squash the other day without a firm plan of what to do with it. I’m in a limbo between Summer and Fall food but it’s not a bad place to be. 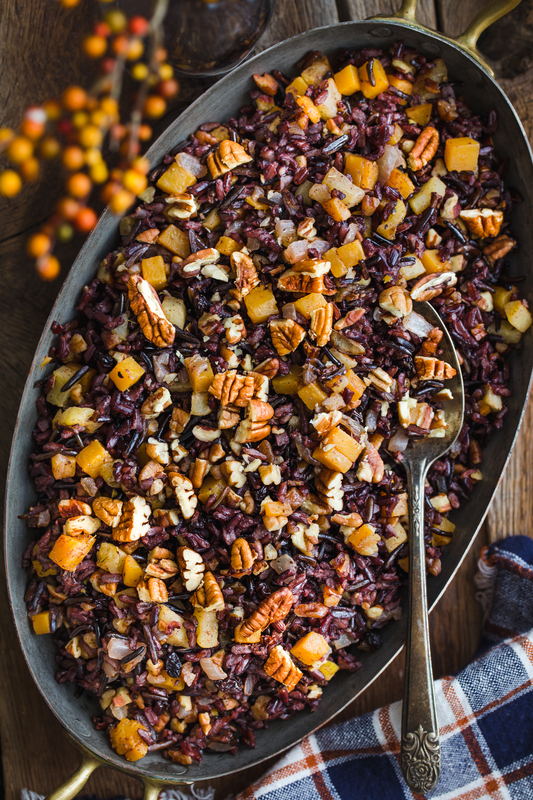 Take for example this Pecan Wild Rice Pilaf. The grilled pork chops are a more Summery main course, but I was definitely in the mood for something Fall inspired to go alongside. 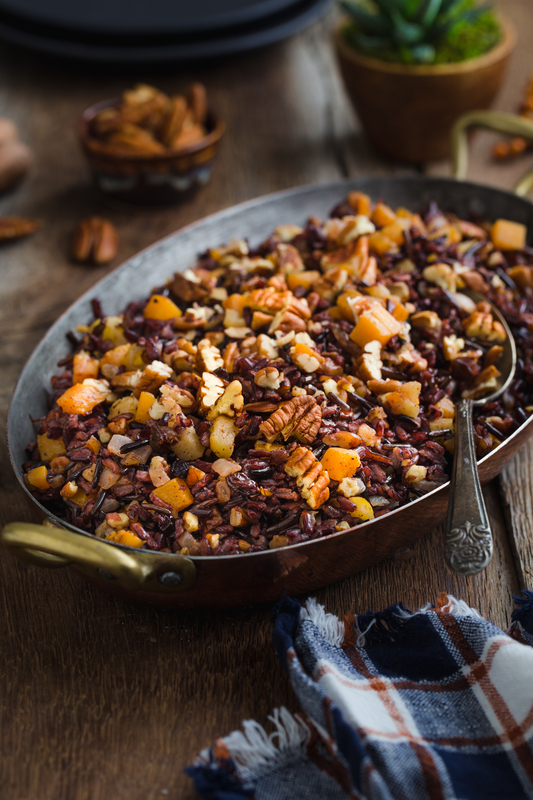 I ended up making a version of this Pecan Wild Rice Pilaf and it completely hit the spot! In my first version, I didn’t add apples, but I went back to the drawing board and upped the Fall factor by adding a little bit of diced apple for some natural sweetness. My favorite aspect of this pilaf, though, is the addition of the chopped pecans. The pecans get cooked into the vegetable mixture which brings out their natural sweetness and enhances their nutty flavor. The crunch that the pecans provide is truly what rounds out this dish texturally. Plus, their buttery nature is a perfect pairing to the apple and butternut squash. Did you know that pecans are harvested in the Fall? They are actually the only tree-nut that is indigenous to North America. In fact, over 80% of the world’s pecan supply are grown in America. I truly love that about pecans. Friends, this pilaf is the complete package! Not only did this Pecan Wild Rice Pilaf hit the spot alongside our grilled pork chops, my mind kept drifting toward all of the fall dinners that this would pair with. Need a new dish at your Thanksgiving table? Pecan Wild Rice Pilaf! If you don’t have butternut squash try acorn squash or try swapping pears for the apples. Either way, this pilaf is going to be a cozy, warm side dish that will transition for these last days of summer into the cool nights of Fall. Bring stock, water, nutmeg, ginger, 1 teaspoon kosher salt, cloves, and cinnamon stick to a boil in a medium size saucepan. Add rice and bring back up to a simmer. Reduce heat to low and half cover with a lid. Allow rice to simmer for about 45 minutes or until tender and liquid is absorbed. Remove and discard cinnamon stick. While rice is cooking, heat olive oil and butter in a large skillet. Add onion and cook, stirring frequently, until onion is translucent; about 4 minutes. Add in butternut squash and cook stirring often, until squash is tender and beginning to caramelize at the edges; about 8-10 minutes. Add in apples and cook for an additional 3-4 minutes or until apples soften. Season mixture with salt, pepper, thyme, and ground cinnamon. Stir in chopped pecans and currents and cook until pecans are slightly golden and fragrant. Remove mixture from heat. Stir butternut squash mixture with cooked rice and adjust seasoning to taste. Serve warm or room temperature. Wonderful recipe. Made it for my sister when she came to visit. Going to make it again just because. Does take a little longer to cook than recipe says. 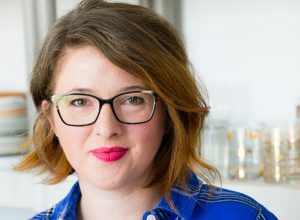 This looks terrific and I’m going to make for dinner tonight. Is the cloves ground or whole? Also, can black rice be sub for brown or white? I served this at an early Christmas Party on yesterday. It was a hit! Couldn’t find currants, so I substituted golden raisins. I’ll definitely add this to my repertoire! Thanks! I made this at Thanksgiving this year and it was amazing. One difference was that i used shredded and lightly roasted brussel sprouts instead of the currents. Very very tasty and was unanimously voted in as a new standard Thanksgiving dinner item! Thank you!